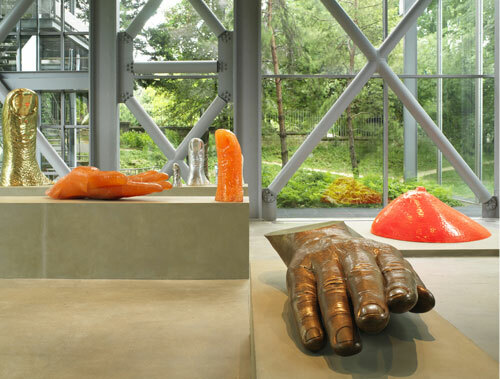 fondation cartier is a museum in paris dedicated to promoting and raising public awareness of contemporary art. each year it organizes a program of exhibitions based on either individual artists or themes, and commissions work from international creatives, thus enriching its important collection. ‘césar – an anthology’ is an exhibition dedicated to the work of the famous french artist. architect jean nouvel was invited to curate the show selecting works from his friend césar’s 38 year career, whilst also designing the exhibition space. works featured in the exhibition include metal sculptures from his series: ‘fes – animaux imaginaires’, ‘compressions’ and ‘expansions’. the foundation cartier websitefeatures works from the show plus an insightful interview with jean nouvel. gimme the same cash and ill think of better artpoppy and crowdpleasers, in one word lazy “art“`i dislike..